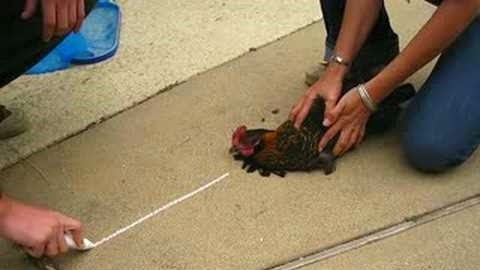 A few years ago, I had posted a video showing a cool trick that can be used to hypnotize a chicken. In today's post, we will dig a bit more into this whole chicken hypnosis thing. The trick is quite simple. All you have to do is hold the chicken's head down against the ground, and draw a straight line using a stick, your finger, a piece of chalk or whatever. This strange animal behaviour is officially called 'tonic immobility', a natural state of semi-paralysis that many animals exhibit when under threat. Commonly known as apparent death, playing dead and playing possum, this state serves as a defensive mechanism as most predators prefer live prey. In chickens, this is most probably a vestigial trait as it doesn't seem to have a useful purpose. The chicken doesn't make a good job hiding the fact it's still alive. Its obvious that is breathing and we can see some eye movement and blinking. I guess we will never know the answer to this. Probably a farmer with lots and lots of free time! Most farmers are familiar with the trick as the method is passed down from generation to generation. The first known written reference comes from the 1646, in "Mirabile Experimentum de Imaginatione Gallinae" by Athanasius Kircher, a 17th-century German Jesuit scholar and polymath who published around 40 major works. I never really thought of animals being able to get hypnotized. when we think of people getting hypnotized we normally do it because it is fun. I find it neat that animals use these as a defense mechanism. hypnosis can be used for a lot of things and I think its a good idea when doctors use it when doing procedures to reduce pain. if hypnosis really works to reduce pain what else could hypnosis be good for? This is dumb, there is a much better way to hypnotize your chicken and they are actually gone, and I mean gone. So you tuck there head under there wing with them sitting on the ground. Then you take your other hand and slap the ground beside then hard so that it makes a loud thump. Let go of the chicken and it will stay like that. Its good for if you need to examine an injury or something and the chicken wouldnt normally let you.